It is now 12 years later from when Sean and I first ventured to Europe in 1986 and we are now living in the UK doing a teacher exchange with the CTEP. We arrive via the train to the ferry docks for our journey across the channel only to be told that the storm has prevented all boats from sailing we will just have to wait. And wait we did. For hours. What the Met Office called a “vigorous” depression in the Atlantic had halted all ferry service to France. Oh this is a great start!!!! Eventually, we finally did set sail for France having no hope of getting the train I had paid for on the other side that would take us into Paris. We would arrange to take another train and finally arrive a day late at about 3 in the morning. Our hotel room is small, really small, but it has it own bathroom so things are looking up. We try to dry some of our very wet clothes, eat the bag full of Burger King that Sean went out and got, and go off to bed. After all we only have the next day before we have to start the whole journey back again. We awake in the morning to a knock on the door. I walk across the beds, since there is no floor, just beds. I open the door to see a tray with 3 croissants, a silver pot of coffee and a pot of hot chocolate. Now if you can imagine the most amazing cup of coffee the world has to offer, this was it. Thank goodness Sean didn’t drink coffee so the entire coffee pot was mine, all mine! This was the perfect start to our day, Paris was going to be amazing! I keep saying this statement out loud as if it will help the outcome. Once out on the streets of Paris we are greeted with rain. The kind you get in Prince Rupert, that comes at you sideways, ensuring you are soaked within a few minutes. I have managed not to pack any underwear for Sean so our first stop will be the C&A for undies. Go figure Paris does not sell tightie-whities, so Sean is the proud owner of a 6 pack of very skimpy black Parisian undies and he is not impressed. I am determined not to have the rain ruin our day but soon it is very apparent that we are going to have to change our itinerary to just a few sights. So I consult the Madeline books. It was now half past nine, so we headed out in the rain, off to the Luxembourg Gardens to perhaps see a tiger in the zoo that Hannah could say pooh pooh too. Then I held her hand as she walked on the edge of the bridge knowing full well how to frighten her dad. We went up to the second floor of the Eiffel tower to check out all that Jules Verne had to offer. Then down to the bottom of the tower, where two very rain drench parents watched their little girl ride solo on the Double Decker Merry Go Round and were thankful that not a single gypsy lady was in sight. The day was not as we had planned, but we went back to our hotel, we broke our bread, brushed our teeth and went to bed. I did however remember to order two pots of coffee for the morning as I knew I would need them for the trip back to England. Our poor little Hannah continued her Madeline story. Once back in England she was rushed to the Bristol hospital to be diagnosed with double pneumonia. 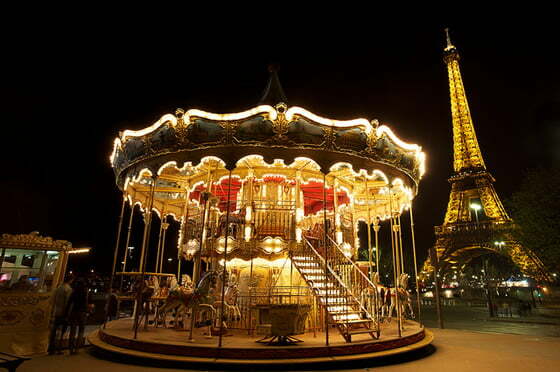 Ah Paris, I will love you one day! This entry was posted in Loving Paris in 22 years and tagged 1998, autumn, Bristol, budget, burgerking, Carousel, children travel, Coffee, croissant, CTEP, Eiffel tower, Family, ferries, Jules Verne, lights of Paris, love paris, Ludwig Bemelmans, Madeline, parents, Paris, pneumonia, rain, School breaks, statue of liberty, train, Travel. Bookmark the permalink.